I live in DC. I love it here. 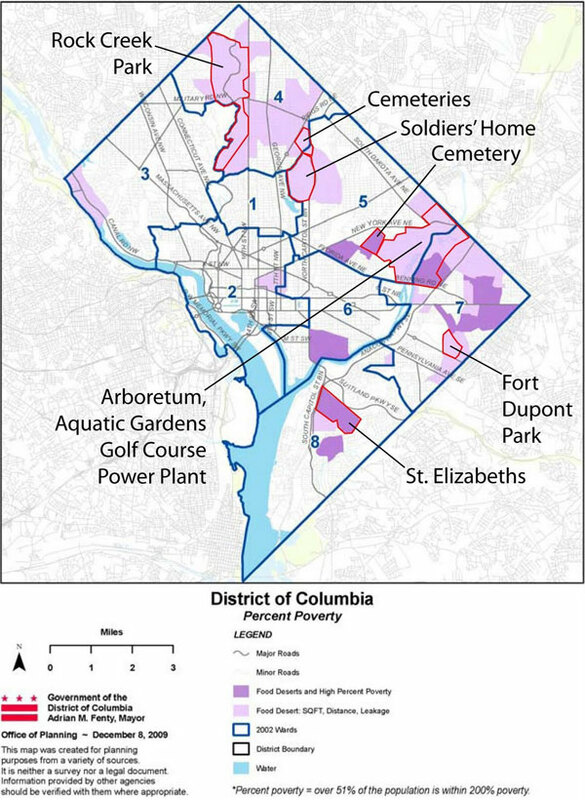 In the 7 years that I have lived in the DC Metro Area I have lived in Northwest DC, near American University and Arlington, and now more recently a neighborhood in Ward 5. In my old neighborhood I lived 3 blocks from Harris Teeter, a few hundred feet from 3 convenience stores and 1.5 miles from a Whole Foods. The part of Arlington I lived in has a “walkability” score of 97/100, and where I currently live has a walkability score of 77/100. 77 is still good, but not as good, and the access to food is considerably different. There are several micro markets, two small groceries, Timor Market and Windows Market and a Harris Teeter and Whole Foods about 1.5 miles away that are reachable by crossing major roads along the way. However, the highlight of this neighborhood is the Farmer’s Market. I walk with friends to the market on the corner of Rhode Island and 1st Street. We meet our neighbors there, and are delighted with the overwhelming number of puppies and babies that we normally don’t see on the busy Monday – Friday schedules. But more than the puppies and babies, I get to see fresh baked bread, a diverse variety of cheese that would make the most selective wine bar jealous, and fruits and vegetables that literally make your eyes grow wide. The Bloomingdale Farmer’s Market, every Sunday is the only consistent source of fresh and plentiful produce in the “neighborhood”. It cannot be underestimated the value that fresh fruit and vegetables provide to people of all ages. In my experience the Bloomingdale Farmers’ Market, helmed by Robin Shuster, makes the extra effort to highlight sales, and provide recipes and ideas for using all of the different options that show up week to week. I have shopped at other Farmer’s Markets before, and of course some people are turned off because they are deemed too expensive. The vendors that appear every Sunday in Bloomingdale are the same as at the Dupont Market, but luckily the prices are not. The vegetables that I buy from some vendors total out to be considerably less expensive than the same items I would buy at Trader Joe’s or any other supermarket. So, what’s the big deal? Why all the talk about the Farmer’s Market? Tonight there is a meeting to discuss continuing the Bloomingdale’s Farmers’ Market. There is concern about the lack of parking and too much noise. My concern is about lack of the most succulent and juicy peaches in July, ripened tomatoes in Augusts and apples in September. If you want to support the Farmer’s Market please join the community Dec 20th at 7pm to discuss the future of the Bloomingdale Farmers` Market as well as parking issues related to local churches and the Big Bear Cafe. The meeting will be at 7pm at the Metropolitan Wesley AME Zion Church at 1st and North Capitol, NW, and the meeting is open for all to attend.